I often marvel at some of the advancements made in the outdoor industry over the years and bowfishing is no exception. Just about everything has improved in the bowfishing realm from the types of boats we use to the bows and other hardware we use to shoot fish. Bowfishers have been targeting carp for many years now as they are an invasive species to our rivers, creeks and lakes. Carp are usually easy to find and never fail to provide a good shooting opportunity when trolling around the shallows in a boat or even walking the shoreline if you are land-bound. Carp can usually be found in the day or night time in various places. During the day time I will usually go looking for carp in shallower areas like flats and the back of creeks and coves. Carp like the warmness of the sun so you can find them out in open water in areas like this “sunning” themselves. If you can be stealthy and sneak up on them, you can usually get a few shots off on a group of fish before they scatter into the safety of deeper darker water. At night, I like to patrol the shorelines as well as the same creeks and coves from the daytime. One old trick I have learned over the years is to go to your local feed store and purchase a bag of range cubes (also known as “cattle cubes”). These are large hard protein pellets that release over time in water as they soften and carp just love to eat on them. You can bait an area 2-4 hours in advance of your bowfishing trip, scattering the cubes along shallow shoreline areas in the water, and usually they will always attract carp to the baited areas. Fish main lake points, coves, creeks and other areas on the outer edges of the lake. Fishing this way makes bowfishing on land very accessible and efficient as well so you can get in on this action even if you are fishing on land. If you are not in a boat, invest in a good flashlight that will penetrate the water well. I like a white CREE LED flashlight instead of a colored LED light you might use for four legged critters and you can get a bow mounted version of this type of flashlight from many online retailers. Many fit right into your stabilizer of your bow or mount around the stabilizer in some way. You want to scan with your light for fish and get off that perfect shot when you find them. 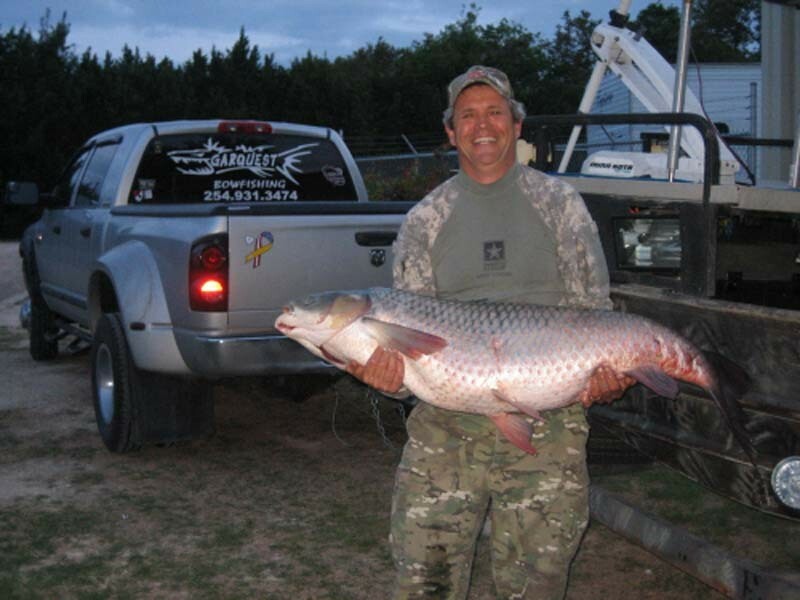 Professional bowfishing guide Marty McIntyre with a grass carp. When shooting at carp, remember to AIM LOW. Most first time bowfishers don’t aim low enough and shoot over the fish. Sticking fish consistently takes practice but it improves over time if you use the right fundamentals. Shoot for the top center mass of a carp as they are widest in the middle of the body. The same goes for buffalo, gaspergou and other rough fish built like a carp. This also leaves you a margin for error if you shoot too high or low. Another advantage to shooting center mass is that you get the thick spine of the fish if your arrow penetrate through the fish. However you enjoy bowfishing, be sure to concentrate on having fun with this action-filled sport. If you’ve never been bowfishing before, consider hiring a guide such as my friend and professional guide Marty McIntyre from GARQUEST Bowfishing Adventures (www.garquest.com) as most guides in this realm will be happy to show you all the gear you need to go out on your very own adventure. Remember to aim low, think big, and have a blast out there on the water.